Hello friends. Yes, here I am again in costume (after Halloween!) You may wonder what is going on with me these days…or not. Either way, the day after Halloween the kids and I and my son’s girlfriend went to the local Halloween store to browse around for bargains. 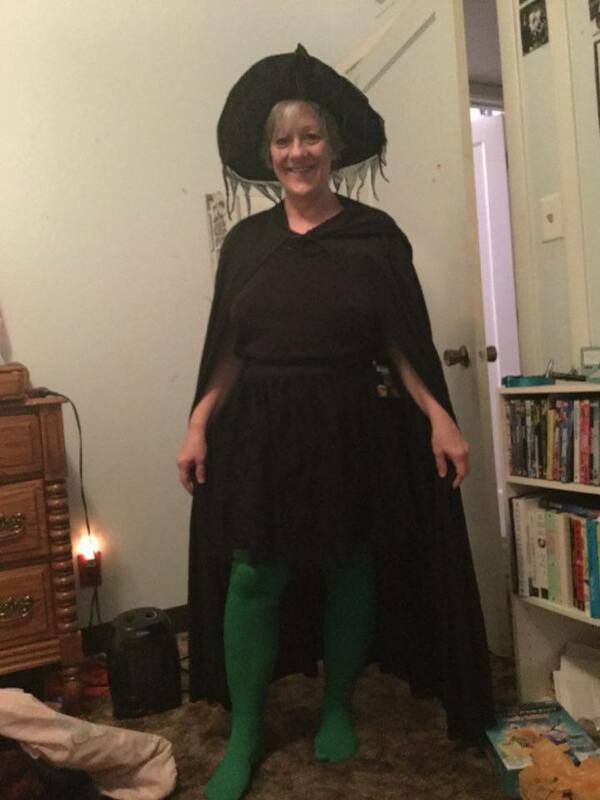 Well, as you can see, I found some green tights, a cape, a black skirt with bats on it, a witch hat and green face makeup. I wish I had gotten a better close-up of the skirt, but I still may do that at some point. 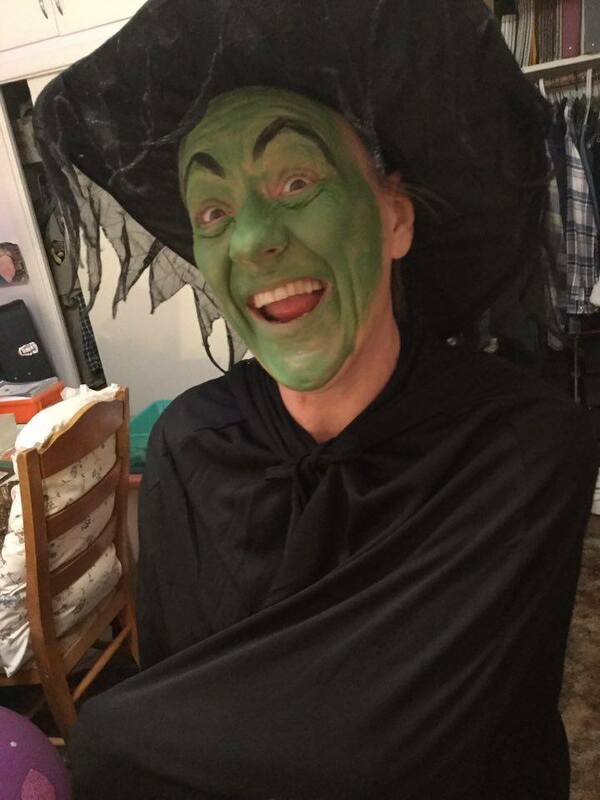 Anyway…..
Perhaps you hate the character of the Wicked Witch of the West, but I have always loved the way the actress Margaret Hamilton played her. I grew up watching The Wizard of Oz every year on television. It was the one movie I looked forward to every year and made sure I never missed. However, my kids never took a liking to it, so needless to say I haven’t seen it that much in the last twenty years, but I do pop in the DVD my husband gave me several years ago for a gift every now and then. What do I love about this character? Well, she is one of the best antagonists I have seen portrayed in the movies. Dorothy has something she wants, and she is bound and determined to get those ruby slippers (even though they aren’t ruby in the book.) I think most antagonists seem to have the attitude that someone has something they want and have convinced themselves they are entitled to it more than the protagonist is! She does this well, and of course she tries to hurt Dorothy’s little dog and her friends in order to have some leverage over her. Also, Margaret Hamilton does such a great witch voice! “I’ll get you my pretty, and your little dog, too! !” That is one of my all-time favorite lines of hers. In fact, for some reason, I remember most of HER lines more than any other characters in the movie. I used to be able to talk and sing along with everyone in the movie and might still be able to do that even now! So….since I am an avid reader and had never read the book growing up, I decided to buy it a few years ago and read it. Oh how different it is…but you may have already known that. I have to say that I like the movie much better and have no desire to ever read the book again or any of the other books in the Oz series. I like all the changes they made with the characters for the movie adaptation! I guess I am just too attached to how these great actors portrayed these characters so differently than L. Frank Baum wrote them! But that is just me!! Well, I am planning on experimenting with doing more makeup and possibly costuming soon. It’s another way to try and express myself artistically I think. I used to always want to do backstage help with plays but never pursued it. I think it would be a lot of fun. So it is something I am thinking about for the future once my daughter is done with her senior year. There are a couple of local theater groups but for use they are still a 45 minute drive away and their schedules just don’t fit in with mine yet. So in the meantime I will play around on my own! Posted on November 9, 2016, in Art Talk and tagged The Wicked Witch of the West, The Wizard of Oz. Bookmark the permalink. 2 Comments.